(Nanowerk Spotlight) Developing chemicals, molecular precursors, and industrial products from petroleum resources is a conventional practice. Plastics, detergents, even pharmaceuticals are derived from petrochemicals. With an increasing focus on the economic and environmental issues associated with the processing of petroleum-based chemicals, scientists are seeking for alternative routes to develop molecules from naturally available plant or crop-based raw materials. While 'green production', 'green chemistry', and environmentally sound and renewable fuel sources are all the rage these days, it seems quite ironic that we could see the chemical industry coming full circle on its raw material sources: In the early parts of the 20th century, most non-fuel industrial products such as medicines, paints, chemicals, dyes, and fibers were made from vegetables, plant and crops. During the 1970s, petroleum based organic chemicals had largely replaced those derived from plant materials, capturing more than 95% of the markets previously held by products from biological sources. Recent developments in bio-based materials research show prospects that not only fuel (see "Nanotechnology's role in next generation biofuel production") but many other petrochemical derived products can be replaced with industrial materials processed from renewable resources. Researchers continue to make progress in research and development of new technologies that bring down the cost of processing plant matter into value-added products. Particularly interesting for the fields of nanotechnology is the design and development of soft nanomaterials from renewable sources. Generating these materials – surfactants, molecular gels, liquid crystals, self-assembled organic nanotubes, twisted fibers and helices – from renewable resources could have a significant impact on production technologies and economies. The low cost, abundant availability, renewability, and the eco-friendly characteristics of bio-based raw materials are promising factors for the future of this field. "Devising general methods to convert bio-based feedstock into value-added molecules/materials is a challenging task," George John, an Associate Professor in the Department of Chemistry at The City College of New York, tells Nanowerk. "We are demonstrating that various bio-based raw materials from plants and crops, for instance several sugars and cashew nut shell oil, could be converted into value-added chemicals like surfactants, and novel molecules (amphiphiles) that could be utilized to generate a wide variety of nanomaterials such as nanotubes and nanoparticles." Although biomass supplies the raw materials, processes that efficiently transform them into valuable molecular entities are necessary. To distinguish the bio-based process from its petroleum-based counterpart, the term biorefinery is used to describe the concept that integrates the processes of converting biomass/renewable feedstock and the associated infrastructure used to produce chemicals and materials. Biorefinery concept in soft materials development (Image: Dr. John, City College of New York). In a recent review article in Langmuir ("Biorefinery: A Design Tool for Molecular Gelators"), John and his team provide an overview of small-molecular-weight hydrogelators and organogelators obtained by combining the concepts of biorefinery and the principles of supramolecular chemistry with a vision of green chemistry. The use of molecular gels (gels fabricated from small molecules rather than polymers) has been demonstrated in applications such as regenerative medicines, electronic and photonic applications, and art conservation. They also have found interest with potential use as drug-delivery vehicles, templates for nanomaterial synthesis, and food structuring agents. "The ability of molecular gelators to immobilize solvent molecules (organic liquids or water) stems from the propensity to undergo supramolecular self-assembly processes," explains John. "The gelators hierarchically self-assemble to form a 3D self-assembled fibrillar network. This has proven to be a versatile, simple bottom-up fabrication strategy for generating not only novel but also unique, highly tunable materials." He points out that nature offers structurally diverse raw materials such as sugars, fatty acids, and lipids that can be exploited to tailor specific recognition events at the molecular level and in turn develop morphologically rich nanoscale architectures. Thus, diversity in nature can be utilized to control the gel network exquisitely for various uses. "Over the past few years, we have developed various amphiphilic molecular gelators from natural renewable resources" says John. "Some of them have been explored in applications ranging from drug delivery to hybrid nanomaterial synthesis." Biorefinery processes apply enzymatic or simple chemical transformations to naturally available raw materials such as vitamin C, amygdalin, trehalose, and cardanol to produce a wide range of amphiphiles and their self-assembled molecular gels. In order for biorefinery applications to be 'green', the process of choice should be selective, energetically efficient, high yielding, and environmentally benign. "Enzymes function as biological catalysts in several industries such as food, specialty chemicals, and additives to name a few" John points out. "They also find applications as the active components in detergents, laboratory reagents, diagnostic reagents, and digestive aids. Enzymes are highly regioselective and exhibit excellent control of the self-assembly process, and with their use, several hierarchically self-assembled materials have been realized." 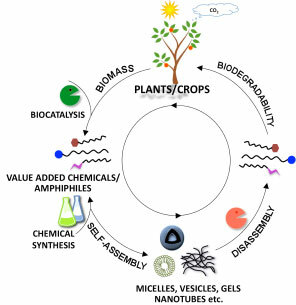 John envisions that future processes may be dominated by strategies that employ microbial processes and enzymes for the sustainable production of commodity chemicals.